This tutorial is only intended for users running the Google Chrome browser on Linux, Mac OS X or Windows operating systems. Google Chrome utilizes a wide variety of Web services and prediction services to improve your browsing experience. These range from suggesting an alternate website when the one you're attempting to view is unreachable to predicting network actions ahead of time in order to speed up page load times. While these features provide a welcome level of convenience, they may also present privacy concerns for some users. Whatever your stance on this functionality, it is key to understand how it works in order to get the most out of the Chrome browser. The various services described here can be toggled on and off via Chrome's privacy settings section. This tutorial explains the inner workings of these features, as well as how to enable or disable each of them. First, open your Chrome browser. Click on the Chrome menu button, located in the upper right-hand corner of your browser window and represented by three horizontal lines. When the drop-down menu appears, click on the Settings option. 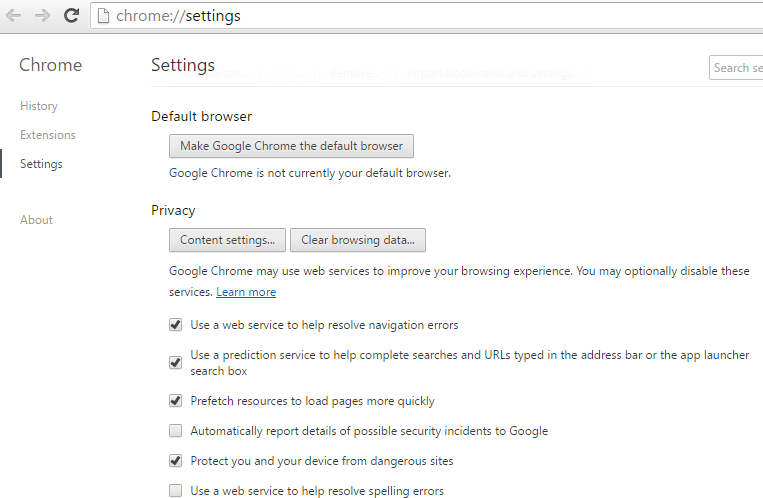 Chrome's Settings page should now be displayed. Scroll to the bottom of the page and click on the Show advanced settings link. Chrome's Privacy settings should now be visible. The first Privacy setting accompanied by a checkbox, enabled by default, is labeled Use a web service to help resolve navigation errors. When enabled, this option will suggest Web pages similar to the one you are attempting to access in the event that your page does not load. The reasons that your page fails to render can vary, including connection problems on the client or server. As soon as this failure occurs Chrome sends the URL that you're trying to access directly to Google, who in turn utilizes its Web service to provide the aforementioned suggestions. Many users find these suggested Web pages to be much more useful than the standard 'Oops! This link appears to be broken.' message, while others would prefer that the URLs they are trying to reach remain private. If you find yourself in the latter group, simply remove the check found next to this option by clicking on it once. The second Privacy setting accompanied by a checkbox, enabled by default, is labeled Use a prediction service to help complete searches and URLs typed in the address bar or the app launcher search box. When typing either search keywords or a Web page's URL in Chrome's address bar, or omnibox, you may have noticed that the browser automatically provides suggestions similar to what you are entering. These suggestions are formed by utilizing a combination of your past browsing and search history along with whatever prediction service your default search engine uses. The default search engine in Chrome — if you have not modified it in the past — is, not surprisingly, Google. It should be noted that not all search engines have their own prediction services, although all of the major options do. As is the case with using Google's Web service to help resolve navigation errors, many users find this prediction functionality to be quite useful as well. However, others are not comfortable with sending the text typed in their omnibox to Google's servers. In this case, the setting can be easily disabled by clicking on its accompanying box to remove the checkmark. The third Privacy setting accompanied by a checkbox, also enabled by default, is labeled Prefetch resources to load pages more quickly. While this setting is not always mentioned in the same breath as the others in this tutorial, it still involves making use of predictive technology to enhance the user experience. When active, Chrome employs a mixture of prerendering technology and IP lookup of all links found on the page. By obtaining the IP addresses of all links on a Web page, subsequent pages will then load significantly faster when their respective links are clicked upon. Prerendering technology, meanwhile, utilizes a combination of website settings and Chrome's own internal feature set. Some website developers may configure their pages to preload links in the background so that their destination content is loaded almost instantly when clicked. In addition, Chrome also occasionally decides to prerender certain pages on its own based on the URL being typed in its omnibox and your past browsing history. To disable this setting at any time, remove the mark found in its accompanying checkbox with a single mouse click. The sixth Privacy setting accompanied by a checkbox, disabled by default, is labeled Use a web service to help resolve spelling errors. When enabled, Chrome makes use of the Google Search spell-checker whenever you are typing within a text field. Although handy, the privacy concern presented with this option is that your text must be sent to Google's servers in order for its spelling to be verified via Web service. If this worries you, then you may want to leave this setting as-is. If not, it can be enabled by simply placing a mark next to its accompanying checkbox with a click of the mouse.